I am a political scientist whose research examines the relationships between rights, governance and public policy, with a particular focus on the Supreme Court of Canada's impact on public policy and political discourse under the Charter of Rights and Freedoms. I am an Associate Professor in the Department of Political Science at the University of Waterloo. I also teach at UWaterloo's Master of Public Service program. I earned my Ph.D and MA in political science at Queen's University, and a BA at the University of Western Ontario. In 2009-10, I was an Associate of the Canada Program at Harvard's Weatherhead Center for International Affairs and in 2010-11 I was a Visiting Researcher at Harvard Law School. In 2016, I founded the Courts & Politics Research Group, which connects political scientists working on courts and the law in Southern Ontario. It currently has 18 members at 10 different universities, and holds regular events including an annual spring workshop. 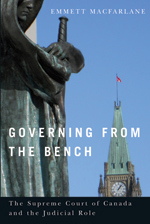 I am the author of Governing from the Bench: The Supreme Court of Canada and the Judicial Role (UBC Press, 2013), and the editor of Constitutional Amendment in Canada (University of Toronto Press, 2016) and Policy Change, Courts, and the Canadian Constitution (University of Toronto Press, 2018). I have published in the International Political Science Review, Supreme Court Law Review, Canadian Journal of Political Science, Canadian Public Administration, McGill Law Journal, National Journal of Constitutional Law, Review of Constitutional Studies, Ottawa Law Review, International Journal of Canadian Studies, and the Queen's Law Journal. Disclosure: I am not a member of any political party. Although occasionally paid a nominal rate for op-eds (by the CBC, Maclean's, the Globe and Mail, and the Ottawa Citizen), I am employed only by the University of Waterloo. All of the non-partisan policy advice I have given to the Government of Canada and parliamentarians of various stripes has been unpaid. I am a regular donor to CAMH in Toronto and Animal Justice Canada, and have in the past made donations to the Canadian Red Cross, the Canadian Cancer Society, and Planned Parenthood. I have received research funding support from the Social Sciences and Humanities Research Council (SSHRC) and the University of Waterloo. My book, Governing from the Bench: The Supreme Court of Canada and the Judicial Role, was published by UBC Press in 2013.